The Aegean region in western Turkey is bordered by the Aegean Sea. On the whole, the Aegean is quite well-developed, with a mild climate. Tourism is the major source of its economy. Fishing docks are surrounded by popular holiday villages and historic ruins. Pine woods and olive groves fringe pristine beaches. Some residents serve as guides for visitors who want to take a tour of the region’s sights. The Aegean region is also an industrial centre. The region’s main products include textile, leather, food, machinery, marble, tobacco, sugar, olives and olive oil. The majority of the population lives near the coast. The region’s popular capital, İzmir, is considered the most modern city in the country. İzmir ranks third in the list of Turkey’s largest cities and it also has the second largest commercial harbour. It has a modern waterfront promenade filled with cafés and bistros. The town of Kuşadası in Aydın Province thrives on tourism, and its quaint villages and sandy beaches with turquoise waters are very popular holiday resorts. One of its well-known features is the small island of Güvercin Adası, connected to the mainland by a land bridge. Its old fortress now has a café-restaurant and a disco, surrounded by trees and a flower garden. The resort town benefits from passengers of cruise ships docking for a day or two before heading to its famous neighbour, the ancient city of Ephesus. Kuşadası has seaside hostels, cafés, discos, bars, pubs, restaurants and shops, some of which are in converted old houses. The town offers affordable accommodations and inexpensive Turkish and international meals. Large hotels and holiday flats and villas are being built on the hills and the hinterland of Kuşadası. The holiday homes here are particularly popular with British and Irish retirees. Kuşadası is prone to earthquakes, as the Yavansu Fault Line passes near it. The city of İzmir is the capital of İzmir Province by the Aegean Sea. It is Turkey’s second largest port next to Istanbul, and its third most populous urban centre. Known in the ancient world as the important port city of Smyrna, modern-day İzmir does not rest much on historic memories; it is one of Turkey’s most progressive cities, with a privatized port and the country’s leading free zone. Young professionals consist much of its workforce, working in international companies and SMEs. The modern city, which consists of 9 metropolitan districts, hosts many festivals and exhibits, the most important of which are the annual İzmir International Fair held around Kültürpark and the International Art Festival. İzmir has a large commercial port and a popular waterfront. Farther inland, the city centre is a busy place with the large, bustling İzmir Bazaar and the Konak, the old Ottoman government mansion. Wide passageways run between modern buildings with interiors furnished with traditional Turkish decor such as carpets, bronzeware, and rugs. The nearby ancient city of Ephesus, famous for its pilgrimage shrines to major goddesses, and the international tourist destination Kuşadası, are incorporated in modern İzmir. Metropolitan Balçova is known for its thermal springs and three shopping malls. Its economy depends largely on retail commerce and tourism. The ancient Agamemnon Baths was referred to in the Trojan War as healing waters where the Greeks were directed to wash their wounds. The hot sulphurous springs and streams are now modern spas and part of a five-star hotel. These facilities are extremely popular, as the waters are believed to ease ailments such as rheumatism, eczema, and sciatica. There are new residential developments in Balçova, aimed towards mid- to higher-income residents. Buca is one of İzmir’s metropolitan districts. Rich Levantines or Latin Christians settled here during the Ottoman period. Some of their grand mansions have been transformed into public institutions, while others are restored and have remained private residences. Buca has a few lovely parks, and many vineyards and orchards planted by the district’s Levantine community. One public square here is named after Çevik Bir, an influential Turkish general in the 1990s. İzmir’s hippodrome is in the Şirinyer quarter. Modern apartment blocks are favoured by immigrants looking to settle here. Gaziemir is a highly developed industrial area thriving on export and furniture production and one of İzmir’s important retail centres. It is home to the Aegean Free Zone industrial park, the science and technology training organization Space Camp Turkey, and numerous international companies. There is continuous construction of large-scale apartment blocks here. The coastal district of Güzelbahçe is highly urbanized in many areas, and still rural in a few, where mountains are still covered in pine forests, land is used for agriculture, and fishing is a form of subsistence. There has been a boom in residential properties in Güzelbahçe. The district has a high education and income level, and luxury villa housing projects in American-style suburbs appeal to affluent Turks. Many residents have studied and worked abroad. Most of the long-time, wealthy residents of the urbanized district of Karşıyaka live in upscale waterfront neighbourhoods. The hillside neighbourhoods are poorer, and have a number of slum-type areas. There is also housing for services and industry workers commuting to work in neighbouring districts. Karşıyaka receives immigrants from the Eastern Anatolia region. 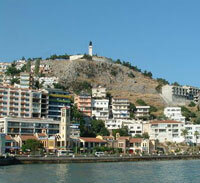 Konak runs along İzmir’s southern coastline to the tip of the Gulf of İzmir. It is İzmir’s administrative centre, home to the governorship and the offices of the metropolitan municipalities. Konak has an active industrial, commercial and residential zone within a large rural area consisting of forest-covered mountains and remote villages. Some of the district’s notable areas are Konak Square, once the site of Ottoman soldiers’ lodgins, the 19th century İzmir Clock Tower, and the market neighbourhood of Kemeralti, built on a filled part of the bay in the 17th century. Alsancak lies within the metropolitan district of Konak, İzmir’s historic centre. The neighbourhood stretches from the waterfront boulevard all the way inland to the square where the 150-year-old central Alsancak railway station stands. Along the pedestrian-only streets there are old and modern buildings housing lovely shops, cafés, restaurants and entertainment venues. The two main roads here are the palm-fringed First Kordon and Second Kordon, both parallel to the coastline. Modern residential and office buildings are concentrated along them. The port of İzmir and Kültürpark, host of the İzmir International Fair, are also in Alsancak.